Quickly Nightwing, to the Batmobile! 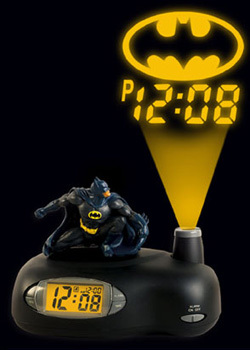 The replacement commissioner, Commissioner Clock King, has thrown up a Batsignal that also shows what time it is. Apparently this new Batsignal, which is powered by both AC and AA batteries, can tell the time and wake me up in the morning after a long night of partying and pounding criminals. It's also only $29.95, and comes with a nice sculpture of yours truly.